Carbon Fiber Vents & Big Brakes - Miata Turbo Forum - Boost cars, acquire cats. Well I've been pretty hard at work over the last 30 days jugling a whole host of projects, but this has been one I've been pretty excited about. So what I've got a good start on doing is building a true vent kit for the front brakes. I wanted to use the Big Brake Corrado kit as a starting point. Now these two images show the air vent which forces air right into the center of the rotor just like F1 teams do to cool their rotors. Since there has to be a mount for the vent, I'm using the big brake caliper mount as an indexer and mounting place. I also have the brackets for the big brake corrado conversion done, but I haven't settled on the mounting style for the CF vents. I think that big piece of carbon fiber (which I purposely made very visible and wide) mounted right upto that big brake rotor is going to look awesome. The time line is probably another couple of months, my supplier is just now wrapping up my carbon cam gears and he has to do the ITB manifold still) I know I read a thread about 3 months ago talking about brake vents, is there still a strong market for this? Letme know what you think on interest. Maybe I'm wrong, but doesn't air flow through the rotor in the opposite direction? 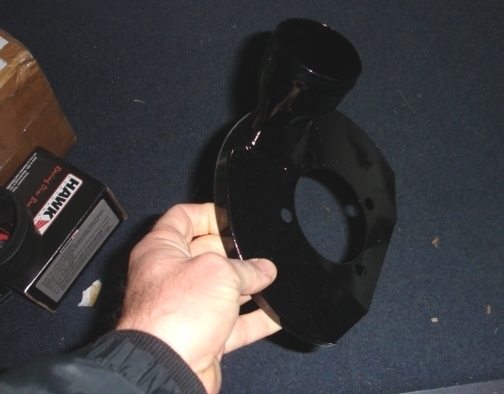 Since the vented rotor acts like a centrifugal pump(poorly) shouldn't it flow from the hub to the edge of the rotor? The F1 (probably long gone by now) style rotors accelerated the air into the middle and vaned it out the back, swirling it in the same fashion for maximum convection. Have to go back to the drawing board on this, and port the air to the back of the rotor.Such a nice looking design, maybe I could move the airflow over the face like this, and put another port straight to the back of the rotor. Last edited by TravisR; 01-09-2009 at 02:47 PM. make a brake shield with 2 or 2.5" hose couplers and I'll buy them. I was going to buy them from ISC racing or whatever, but they won't fit on sport brakes. You have roughly 1-week to make it happen or I have to make my own, lol. Make sure the opening points to just above the hub part, so the air goes through the rotor. Also, make it out of metal or something cheap...no one here will pay $$$ for carbon fiber, but I think many would buy this **** if it were cheap and easy to install. It would also be a plus if we could get a kit for the r-pack lip. but it needs to fit sport and or corrado rotors. Last edited by hustler; 01-09-2009 at 02:52 PM. Yea, that's what I had in mind whenever fidgitk said what he said. I'm glad he said something. I always try to design my parts from the latest SAE articles, that away I know its cutting edge, and the best of the best. It hadn't occurred to me the latest SAE articles don't use Miata's 1980's brake technology. I have test brackets coming in today for the brake swap, when I get those, I'll look at what I can do about a rear brake vent director. I'm still going to see what I can do about venting air over the rotor so I can keep that hunk of carbon by the brake. I can make it an option item for you cheap skates. send the air through the rotor, like every brake set-up I've seen. If you try to "send it over the rotor" then you'll have to make a shroud for each size rotor. You could easily make one 10" brake shroud that mounts really close to the rotor, with a 2.5" hose going to the center, and use it on 1.6, 1.8, sport, and corrado rotors. I don't know that we need a rear duct. Use the sheetmetal so you can sell a ton of them, rather than 4 sets for rich people. Diminishing returns on lightness ftl. Use the sheetmetal so you can sell a ton of them, rather than 4 sets for rich people. Diminishing returns on lightness ftl. No! Let him design and build the most expensive, fancy, JDM ducts in the world for the elite who who need to shave .01 lbs. off each corner at all cost. Who would settle for a decent, well made, affordable, one-size-fits-all duct that simply does the job??? I was going to make the vent that goes into the back of the rotor out of aluminum or carbon whatever is cheaper. Carbon vents on the back probably wouldn't be but 30 or so buck a piece to bond and put together. In all actaulity by the time I waterjet cut aluminum and weld them together, I'd be at about the same price. I'll do it in the cheapest way possible that works well just like the oil pump gears that were 250 dollars under the nearest competitor. I'll do it in the cheapest way possible that works well just like the oil pump gears that were 250 dollars under the nearest competitor. I'm interested, but how soon can you have them together? The track is calling my name. make them out of adobe. I'd be interested in something like the backing plate Hustler describes...for sport brakes. definitely interested. I was going to fab my own but my project list is too long as it is. I am yet to overheat my brakes on track, but i dont see why something like this couldn't benefit anyways. what ever happened to this idea? Its coming, I'm slaying other dragons. Well, the sooner the better. My brakes are going to be hot like fiya, son. Any reason one couldn't just route flexible hose and mount up something that vents right in front of the rotor? Does a metal shield really improve the flow the the rotors that much. You could get nearly as close with a simple hose, no?